The ADS-240 amplifier is a 3U mixer amplifier featuring 70V, 100V and 4-16ohm speaker outputs & 4 universal balanced XLR mic inputs with phantom power. There are 4 audio source selectors on the front panel. 4 Aux inputs by dual RCA type are located on the rear panel. Mic 1-4 with Vox priority selectors. The amplifier is also built-in pre-announcement chime with volume control and remote chime trigger. The REC output for tape recorder and PRE output, AMP input for adding extra signal processor like mixer, graphic equalizer. Volume control over Mic1-4, aux, master & overall treble/bass controls are provided. The ADS 240 Key features like has a combination ¼” and XLR input socket on Mic1 and has a VOX priority level control. 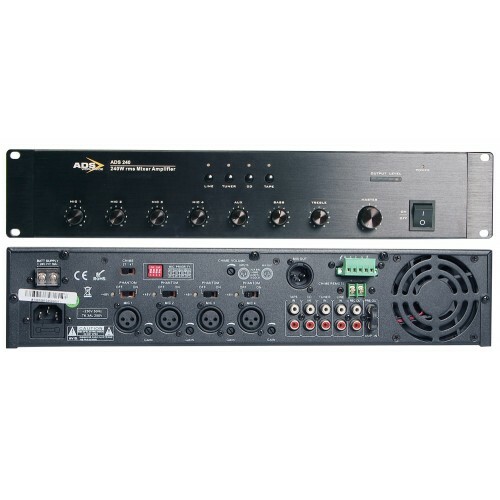 Mic 2 & 3 inputs are via ¼” Jack. 2 AUX inputs both via RCA phono plugs and 1 Telephone input by phoenix connector. And the following outputs: 100V line, 70V line and 4-16Ohm low impedance output. 1 Line output via phono plugs. Complete protection includes short circuit and thermal protection, current limiter and overloading.